STAR PLAYER: Jonny Evans. After a rock solid display against Germany last time out, Evans continued to look like the Champions League player he once was. Nominally at left-back he proved Gareth Bale’s toughest opponent and followed the forward diligently when he dropped into pockets of space. Firm in the tackle, sound of distribution and assured in the air. MOMENT OF THE MATCH: In a game full of commitment and shot through with nerves, the deciding goal will always linger. That it was an own goal will hardly bother Wales at all. Bale provided the telling fragment of class to drive into space and whip a wonderful ball into the middle. Had it been the waiting Hal Robson-Kanu who prodded home rather than the unfortunate Gareth McAuley it would have been even better. VIEW FROM THE BENCH: Chris Coleman continues to gain great credit. At times in the first hour his team seemed guilty of nerves but he remained calm and his decision to deploy a central striker in front of Bale proved crucial in the end. His substitutions were attacking, transmitting to his players that the push for victory took precedence over holding on. Michael O’Neill can be delighted with the way his team played despite the result. Their efforts in patrolling Bale could hardly be faulted, and they pushed forward more than many expected them to. A recall for Kyle Lafferty was well-earned, with the striker looking hungry and focused after two games on the bench. 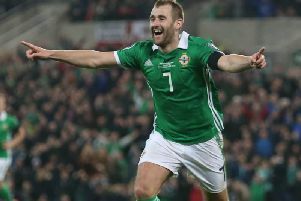 MOAN OF THE MATCH: At 36-years-old there is every chance McAuley will be retiring from international football in the coming days or weeks. If that is the case then a near unavoidable own goal, followed by an early exit as his side chased an equaliser would be no way to go. One of the most passionate players his nation have ever had, he deserved a better swansong than this.